Despite word from apartment investors that the tough economy has forced a sharp rise in the number of tenants paying late or not at all over the past year, the volume of such cases being brought to landlord and tenant courts in the city rose just modestly in the first 10 months of the year, court records show. 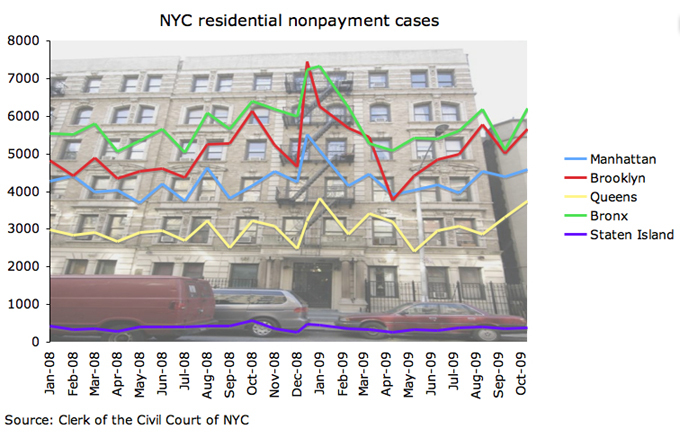 The number of nonpayment cases filed in landlord and tenant courts in the five boroughs through October rose by 5.3 percent to 188,381 in 2009 from 178,752 in 2008, data from the Clerk of the Civil Court of New York City shows. The steepest rise was 9.6 percent in Queens, while in only one borough, Staten Island, filings declined, by 11 percent. The increase in Manhattan was 5.6 percent to 43,321 cases. The cases are filed in civil courts in the five boroughs for the first 10 terms of the year, with each term slightly shorter than a month. Landlord and tenant attorney Todd Nahins, a partner at Borah, Goldstein, Altschuler, Nahins & Goidel, said the low numbers were unexpected. “I was surprised the court says the uptick is [so small],” he said. He speculated that the low number might be explained by landlords becoming reluctant to battle tenants in court and instead renegotiating lower rents. In nonpayment cases, the landlord accuses the tenant of not paying rent. At a real estate panel earlier this month, two investors said they had seen an increase in nonpaying tenants, known as collections, over the past year. Mark Stern, a senior vice president of Chicago-based Wharton Residential, said at that time there had been a rise to 10 to 20 percent now from about 5 percent last year. Mason Sleeper, a principal with real estate investment firm Praedium Group, also said at that event that collections were becoming more of a problem. With unemployment in New York City hitting 10.8 percent in September, its highest level since 1993, and the total number of jobs lost reaching 108,900 since the peak last year, as reported by investment sales firm Eastern Consolidated, some experts expected the number of cases to rise sharply this year. Matthew Baron, a principal with residential and commercial landlord Simon Property Group, said the company was not seeing a significant rise in delinquency. 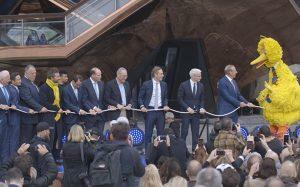 “We have seen an increase, but I would not call it a marked increase, in late payments,” Baron said. “The issue for us is tenant retention.” To retain tenants, Baron said that Simon is offering renewing tenants the same concessions, such as a few months of free rent, typically reserved for new tenants.